Spring seems to be coming, more nice days than grotty ones and the temperature is slowly rising. We have even taken the electric blanket off the bed. Cue a second ice age. Our policy of going out for picnics whenever the sun shines continues. We have had a number of excellent days out, normally aiming for a lake or a chateau. We have seen a number of very interesting places and Bertie loves coming along for the ride. We had often meant to look at the chateau in Chalus, where Richard the Lionheart met his end. It is actually privately owned, and indeed is for sale (with a large house and lots of land). Just 2.5million €. This is the nearest we got. On one day out we came through the “Cité de Clairvivre” which was built in the 30s I believe as a place for TB sufferers to enjoy the bracing country air. It is now used by the French Health Service for a number of purposes, but it still has a wonderful Art Deco air. It also has a large hotel, and we shouldn’t forget that the French Health Service can prescribe spa treatments on prescription, so I guess that the guests are probably recuperating. Reading the 24 Squadron Association magazine (the Hercules squadron I served on) I saw a note from the RAF Museum asking for any photos or other memorabilia about the RAF’s C130s. I remembered the DVD I had created from the videos that my crew shot when we did our 4 months in the Falklands in 1988/89. I looked for my copy, couldn’t find it, looked on my PC, disappeared! Luckily I had sent our loadmistress, the lovely Pam a copy, so she sent it back to me and I copied it. I also sent a copy of the Marham News I produced after the Falklands Conflict, and the two copies of the MAD (Marham Ascension Digest) I produced on Ascension Island during and just after the conflict. On a Roneo machine, if you can remember what that was. I had my first SSAFA job for some time. It was to help out an ex wartime RAF veteran, who now lives with his daughter in the South of the Correze. He had his 100th birthday a couple of weeks ago, and I was able to present him with a card and a bottle of champagne from SSAFA. This had pride of place until he opened his card from the Queen! After a visit to our library a few weeks ago, I decided to come back home the slightly quicker way. Unfortunately this was the road on which the gendarmes had set up their speed radar! 45€ fine, plus one point on my licence. As I didn’t have a French driving licence, this accelerated our decision to swap UK for French. Obviously we didn’t manage to take the right paperwork to the sub-prefecture first go, but it’s all in hand now. Actually went out in the evening to the cinema in Brive, where we saw “the Grand Budapest Hotel”. A really enjoyable film, shown in VO (Version Originale – or English). Dinner out afterwards at a local oriental restaurant buffet not such a success. It’s very good at lunchtime, not enough turnover to keep everything fresh in the evening. Our epicurean researches will continue – there are now two Japanese places in Brive to try. Our last big day out was to the market at the nearby town of Terrason with friends. The market wasn’t that great, but the town is rather nice, with the river Vezere running through it and an attractive old quarter. And we had a very nice lunch! We continue our wildlife spotting from the balcony. 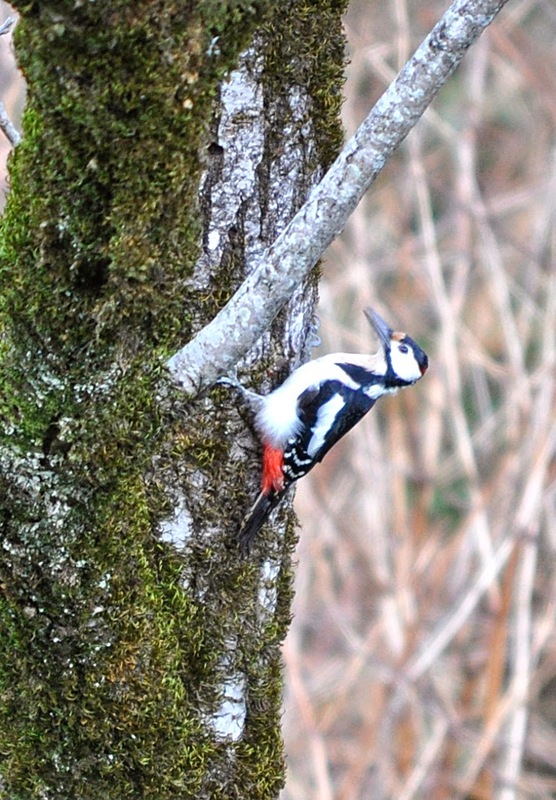 Judy noticed this woodpecker from there, and I am quite pleased with the picture I got with a telephoto lens.